In September 2015 I was able to attend my first Cervivor School. I traveled to San Diego and I did not know what to expect. I knew I was going to meet women who had a similar experience to me, women I could relate to, women with cervical cancer experiences. I was no stranger to cervical cancer or sharing my story at this point, I had first been diagnosed in 2012 and I started sharing my story on my blog so that others could hear my story. I had the opportunity to share my story on video so that it could be shared for #CCAM 2016 to medical providers by a company. I thought I was sharing my story impactfully. What was I going to learn at Cervivor School? I can remember sitting in Cervivor School in aww of all the women surrounding me. Amazed at the amount of women who were ready to get out there and share their personal lives and stories. It was great to see all the different ways these women were ready to advocate. It added fuel to my advocacy. It was like igniting a fire. I transitioned my blog from just a place that I could share information about my story to a place where I could share information with purpose. I started using a call to action approach whenever possible. Cervivor School gave me the tools to reach out to media and have my voice heard. 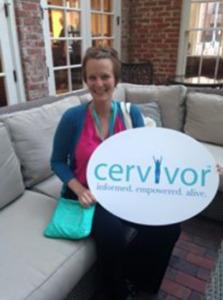 All of the tools I have learned from Cervivor have helped me to grow in my advocacy. I learned a lot about speaking to legislators and how to reach out effectively. My Cervivor story being on the the Cervivor website has been really beneficial for me because if I am working to contact someone I can easily share my story in a great format. One year ago I was invited to go to the Indiana Statehouse and testify on behalf of House Bill 1278. 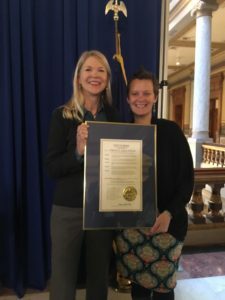 This is a bill that was written so that Indiana would need to develop a strategic plan to reduce the mortality and morbidity rates of cervical cancer by December 2018. I was honored to testify in front of the Senate Health Committee as well as the House Health Committee. In each committee the HB1278 passed unanimously. I was welcomed to be in attendance when Governor Holcomb signed the bill into law; a bill that passed unanimously through the entire Indiana Senate and Indiana House. It was such an amazing experience. It even helped check something off of my Living Life List – I was able to help pass a bill to make a difference in the cervical cancer space. Yesterday I was invited back to the Indiana Statehouse by Representative Sharon Negele, the author of HB1278. I was invited in for a press conference where she was presented a Proclamation in honor of January being Cervical Health Awareness Month. 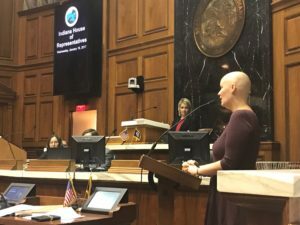 Following the press conference I was able to go onto the floor in front of the Indiana House and share my excitement with the representatives that Indiana is placing value on cervical cancer awareness and is dedicated in reducing the mortality and morbidity rates of cervical cancer. I am so glad that I was able to attend my first Cervivor School and become a Cervivor Ambassador. All of the tools I was given led to helping to make such a huge difference here in Indiana. Have you shared your story on Cervivor yet? Follow this link to share your Cervivor story. It is organized into a great format with prompts that can guide you through sharing your story. Are you interested in becoming an active advocate? Cervivor School 2018 information is available here.